The field of stress analysis has gained its momentum from the widespread applications in industry and technology and has now become an important part of materials science. Various destructive as well as nondestructive methods have been developed for the determination of stresses. This timely book provides a comprehensive review of the nondestructive techniques for strain evaluation written by experts in their respective fields. 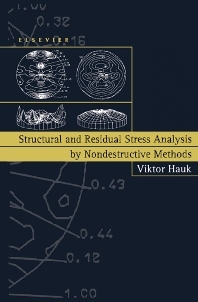 The main part of the book deals with X-ray stress analysis (XSA), focussing on measurement and evaluation methods which can help to solve the problems of today, the numerous applications of metallic, polymeric and ceramic materials as well as of thin-film-substrate composites and of advanced microcomponents. Furthermore it contains data, results, hints and recommendations that are valuable to laboratories for the certification and accreditation of their stress analysis. Stress analysis is an active field in which many questions remain unsettled. Accordingly, unsolved problems and conflicting results are discussed as well. The assessment of the experimentally determined residual and structural stress states on the static and dynamic behavior of materials and components is handled in a separate chapter. Students and engineers of materials science and scientists working in laboratories and industries will find this book invaluable. Preface. 1. Introduction. 2. X-ray diffraction (V. Hauk, H. Behnken, W. Reimers, W. Pfeiffer, Ch. Genzel). 3. Neutron diffraction methods (L. Pintschovius). 4. Ultrasonic techniques (E. Schneider). 5. Micromagnetic techniques (W.A. Theiner). 6. Assessment of residual stresses (B. Scholtes). Subject index.